So far I have featured Epcot and Downtown Disney from our trip to Orlando at the end of April. Today, I am covering Magic Kingdom. 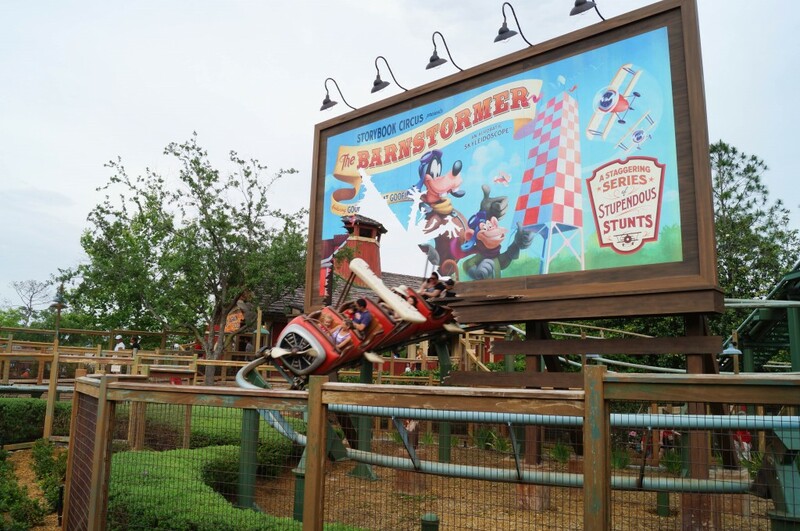 Here is the post on our trip to Magic Kingdom in October. 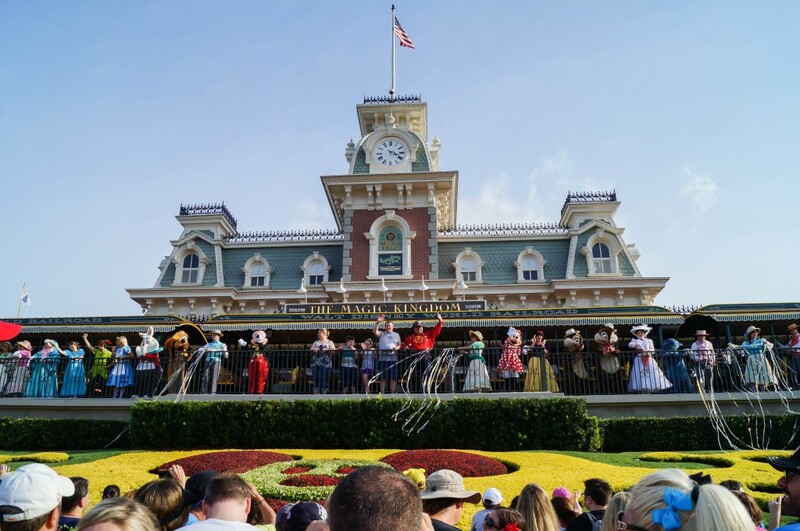 We split up our time at Magic Kingdom over a couple of days. We had breakfast reservations at Crystal Palace one morning, but Evan was tired and not feeling well due to his 2 yr molars cutting through. He got more tired and cranky through the breakfast, so we went back to the hotel once we were finished eating to take a break from the parks (I went to Epcot alone later that day). I am still a bit bummed that Evan didn’t fully enjoy his breakfast with Winnie the Pooh, but at least there were still some wonderful parts to the experience. The interior of the restaurant is absolutely beautiful. It is modeled after the Crystal Palace in England. 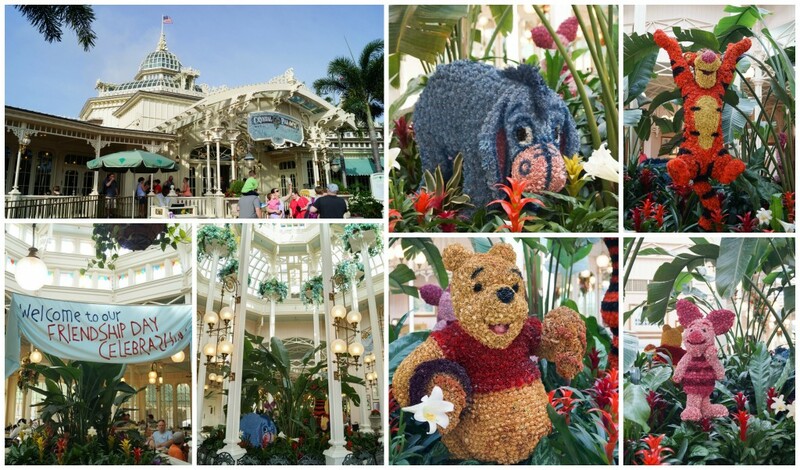 As you help yourself to the buffet, Winnie the Pooh, Piglet, Eeyore, and Tigger make their way around the tables to visit. It is a great way to see the characters without having to wait in the long lines for a meet and greet. There were quite a bit of food options available at the buffet. 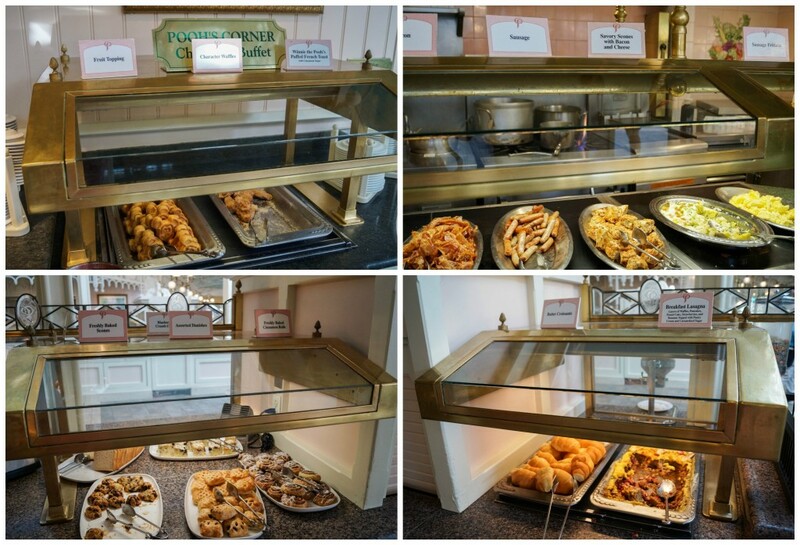 You can find all the usual breakfast items here, from pastries to Mickey waffles and frittatas. There are also two notable menu items: Winnie the Pooh’s Puffed French Toast with Cinnamon Sugar and Breakfast Lasagna (Layers of waffles, pancakes, pound cake, strawberries, and bananas topped with pastry cream and caramelized sugar). I loved the puffed french toast and Chad was particularly fond of the breakfast lasagna. Disney Food Blog has a recipe for the Breakfast Lasagna available. It is shown in the above photo on the bottom right. I was never able to get a photo with the platter full. People swooped in to get more with unbelievable speed. 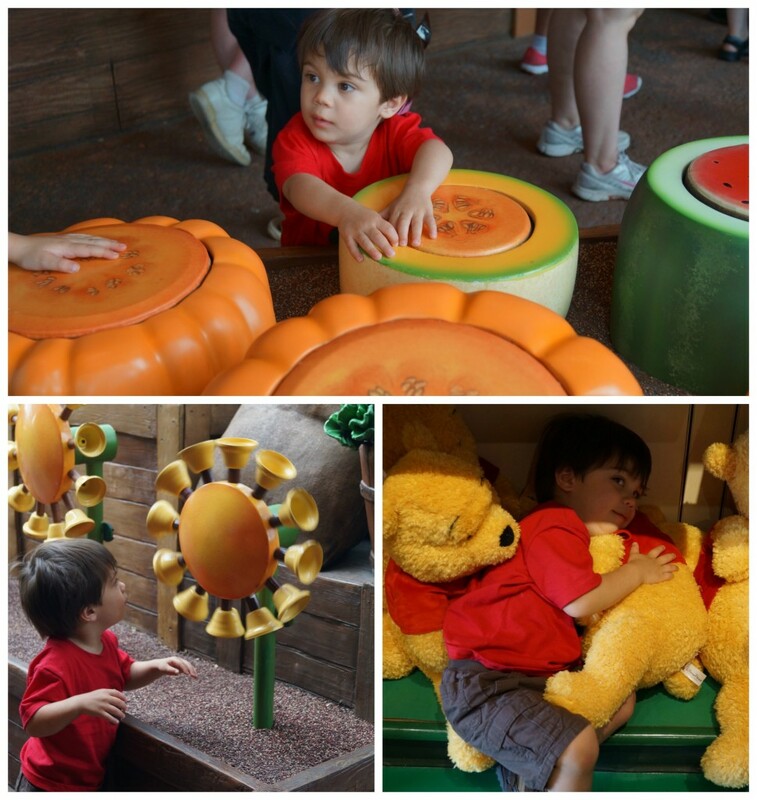 Evan really enjoyed meeting with Tigger and Piglet. 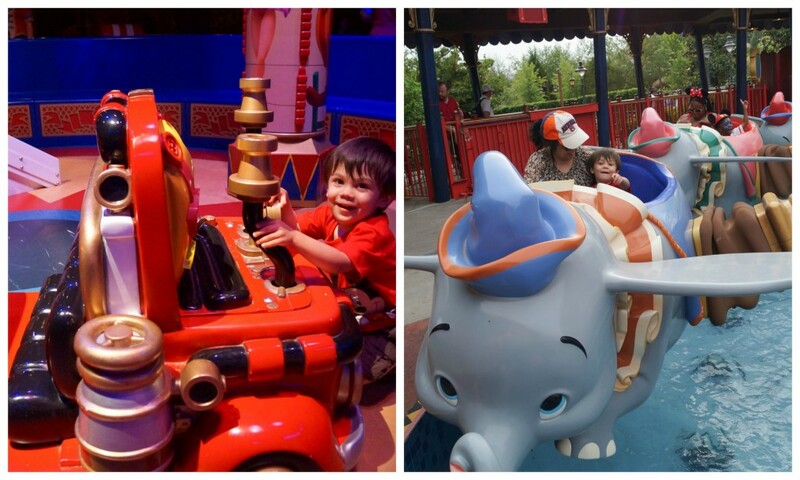 He started to get tired by the time Eeyore met with us and attempted to nap on Pooh. 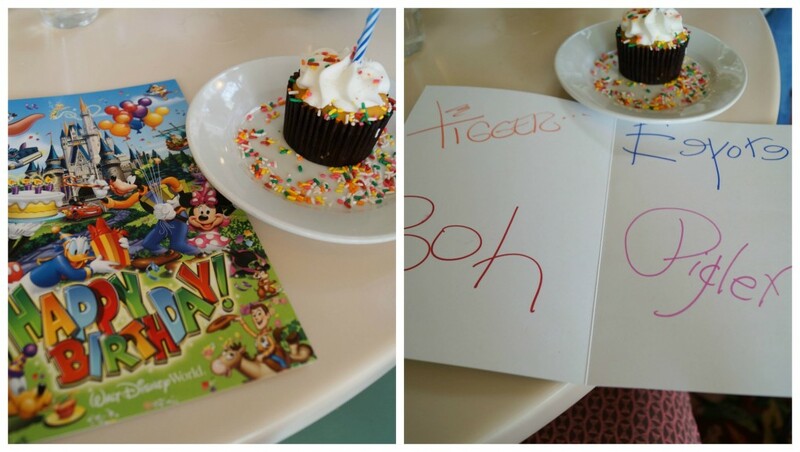 Since we were celebrating Evan’s birthday, he got a cupcake and a signed card from Tigger, Pooh, Eeyore, and Piglet at the end of the breakfast! After leaving the restaurant, we slowly walked through the shops on Main Street to let Evan take a catnap in the stroller before getting on the bus back to the hotel. 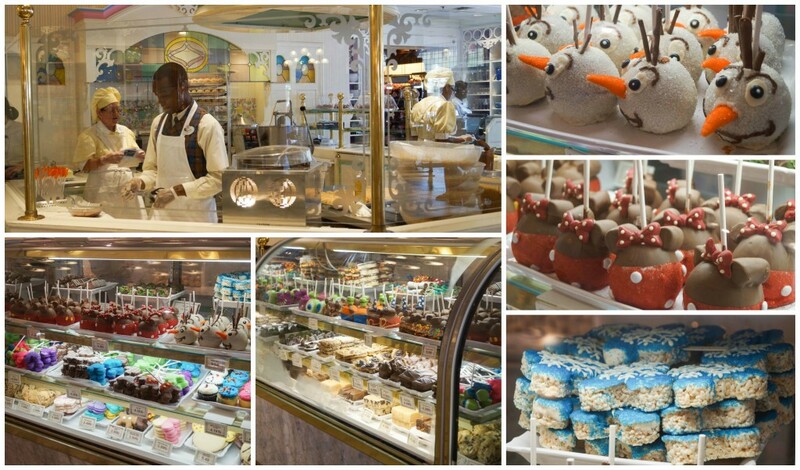 I especially love looking through the Main Street Confectionery. There were a few Frozen themed treats this visit. 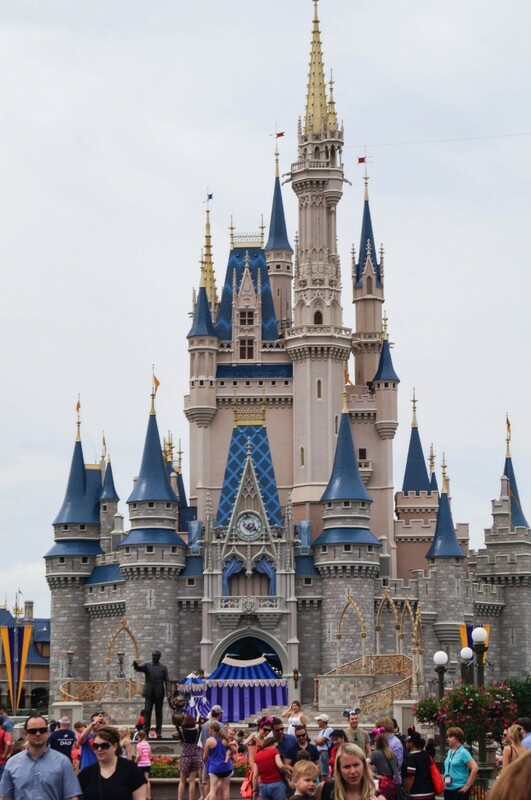 We went back to Magic Kingdom a couple of days later after spending some time at Animal Kingdom. We went straight for The Adventures of Winnie the Pooh since it was going to close shortly after due to a press event for the new Mine Train Ride. Evan enjoyed the interactive line more than the actual ride! We also had to pull him away from the stuffed animals in the gift shop following the ride. You would think he didn’t already have a Pooh stuffed animal at home. 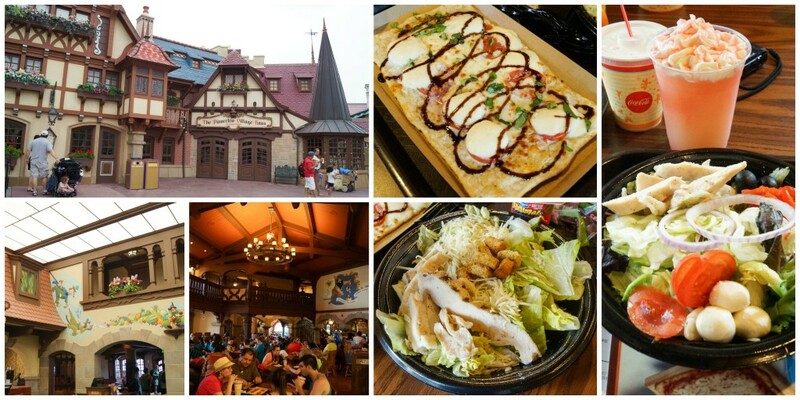 We had dinner at The Pinocchio Village Haus. It is a counter service restaurant with flatbreads and salads. I had the Caprese Flatbread (a crispy flatbread base topped with sliced tomatoes, fresh mozzarella, basil, and a balsamic reduction). Evan shared the flatbread with me and had Macaroni and Cheese. Chad got a Chicken Caesar Salad. Chad’s parents had Mediterranean Salads (Mixed Greens, Chicken, Mozzarella, Roasted Red peppers, Red Onion, and Black Olives) and split a Pinocchio (Lemonade) Slush. Overall, I enjoyed the restaurant for a quick bite to eat. There was plenty of seating to choose from so we didn’t have any difficulty finding a table, even at a prime dinner time. Evan was just tall enough to ride his first roller coaster! He wasn’t too sure what to make of it. He didn’t get upset, but he didn’t seem too happy either. Instead of a Caprese Flatbread, I made Caprese Pizza. I just personally like a thicker crust on my pizza. Use a little less dough and form the crust thinner to make it closer to a flatbread. To make a balsamic reduction: In a medium saucepan, combine 1 cup balsamic vinegar with 1/4 cup honey over medium heat. Once simmering, reduce heat to medium low and simmer until thickened, 10-15 minutes. It should be thick enough to coat a spoon (reduced to about 1/3 cup), but not burn. I could have gotten my glaze a bit thicker. I was a little nervous about it burning and only reduced it to about 1/2 cup. In a small bowl, sprinkle yeast over warm water. Let sit for a minute, then stir to combine. Let sit until frothy, about 10 minutes. In the bowl of a large food processor fitted with a dough blade or a large bowl, combine flour, salt, and sugar. Mix in yeast with water to form dough. If too crumbly, add a tablespoon of water at a time until it comes together. If too sticky, add a little flour. On a lightly floured surface, knead until smooth and elastic. Oil a large bowl and add dough, turning to coat. Cover and let rise until doubled, 1-2 hours. If using a baking stone, sprinkle cornmeal over a large pizza peel. Otherwise, sprinkle cornmeal over a large baking sheet. Form the risen dough into a large rectangle, about 15 inches long. Let rise for 30 minutes. Preheat oven to 450 degrees F. If using, place baking stone in center of oven. Drizzle olive oil over the crust. Sprinkle with salt, Parmesan, then minced garlic. Evenly arrange mozzarella and tomato slices over the top. Carefully slide pizza onto stone or place baking sheet in oven. Bake in preheated oven until the crust is golden and cheese is melted and bubbly, 8-12 minutes. Drizzle with balsamic reduction and sprinkle with basil before serving. Love all the photos. The pizza looks good too!